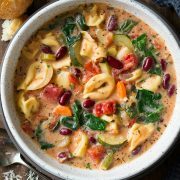 Minestrone Soup – this healthy hearty soup is brimming with fresh vegetables, protein rich beans and tender pasta and it has such a delicious flavor! I’ve included the how-to for slow cooker and stove-top, so go with whichever is more convenient for you. 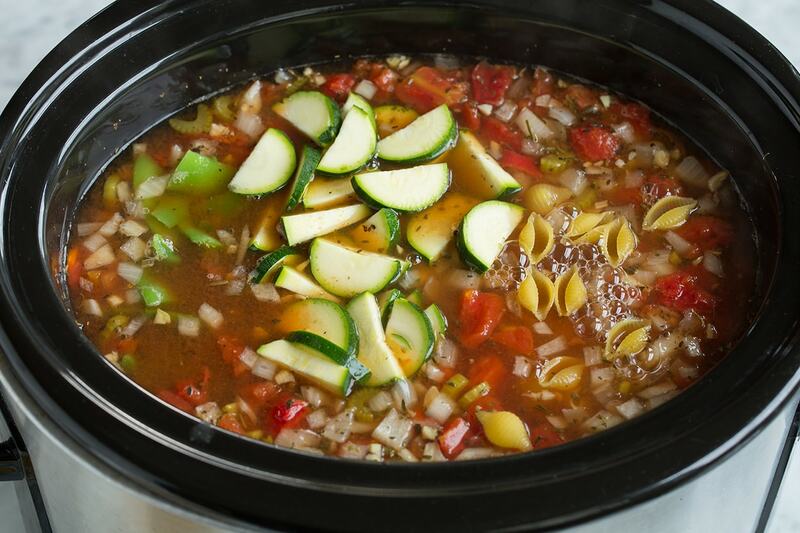 Chances are you already know what minestrone is, if not now is the time to try it! 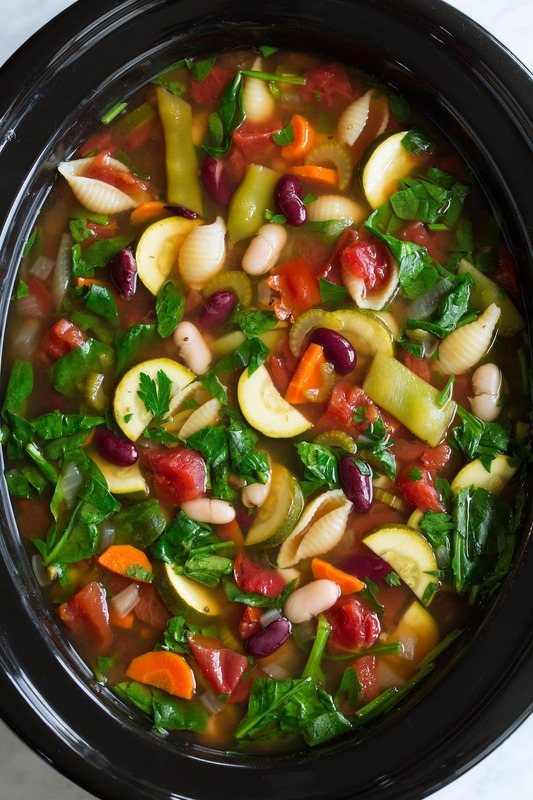 It’s an Italian soup made with veggies, pasta or rice and beans and seasoned with herbs. 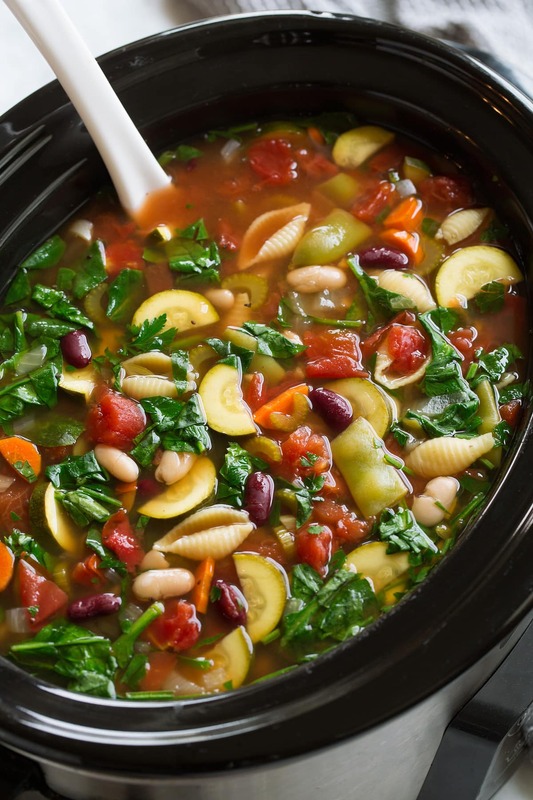 I’ve been using this Minestrone soup recipe for 6 years now. Chances are it will become your favorite too! Don’t be scared by the long list of ingredients in this recipe. Much of it is dried herbs that you likely have on hand and basic pantry items like canned beans and tomatoes. The easy prep makes up for the lengthy list of ingredients. Plus much of it is vegetables so you’ve got to feel great about making this one (not to mention how low in fat it is). This is one of those throw it in the slow cooker and go recipes, which I love. Who doesn’t love a recipe like that? The stovetop version is really easy too! Want to see how easy it is? Watch the Minestrone video! 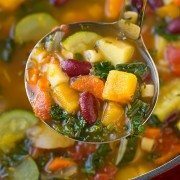 What Ingredients do I Need for Minestrone Soup? Can I Use Other Vegetables? The great thing about this recipe is that you can use other vegetables you may already have on hand. Asparagus, kale, peas, yellow squash, or cauliflower are all good choices. 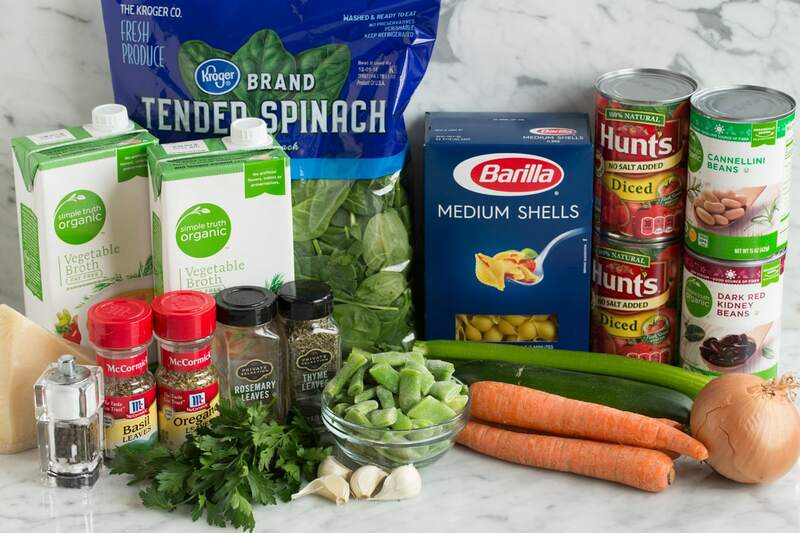 How do You Make Minestrone Soup? Cook on low heat 7 – 8 hours or high 3 1/2 – 4 hours. Stir in zucchini, pasta, green beans, garlic, and cook on high heat and additional 30 minutes or until pasta is tender. 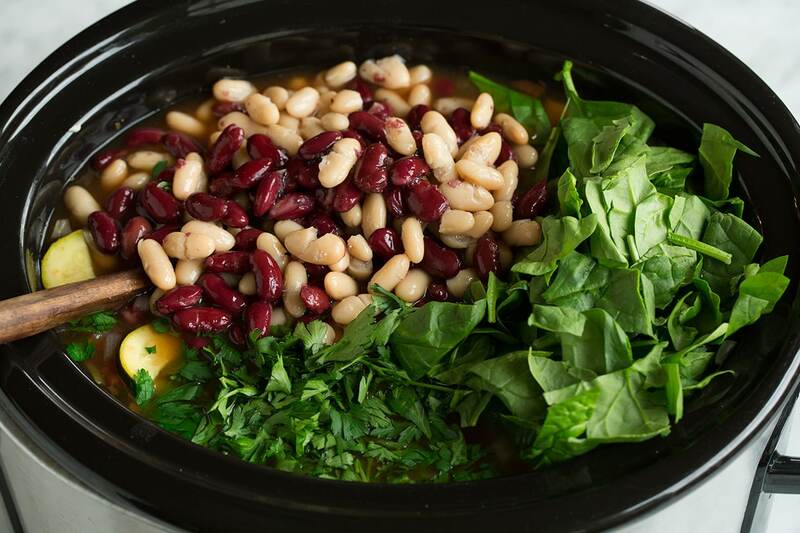 Stir in spinach, kidney beans and cannellini beans, and parsley and cook several minutes until heated through. Heat olive oil in a large pot. Saute carrots, celery and onions, then garlic. Pour in broth, tomatoes, herbs, S&P. Bring to a boil, reduce heat, cover and simmer 10 minutes. Add zucchini, green beans and pasta, cover and simmer 10 – 15 minutes longer, or until pasta is tender. Add kidney and cannelini beans and spinach and cook 2 minutes longer. Can I Use Different Pasta? Don’t have pasta shells? Use any short pasta shape you like. You can even omit it. Yes. 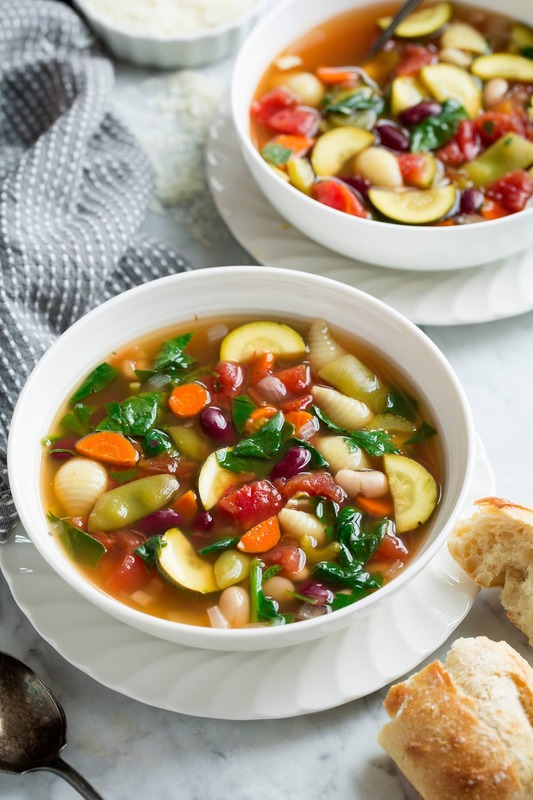 This minestrone soup is vegan just serve with vegan parmesan or omit. I really don’t think it needs it but you could add ground beef or Italian sausage. If you’re making this soup in advance and plan on storing it for later then DO NOT add the pasta. It will absorb excess broth and get mushy if it’s left in the soup for too long. Instead, make the soup as instructed but only add cooked pasta when serving. Can I Freeze Minestrone Soup? This soup freezes well without the pasta. You can freeze cooked pasta separately so it doesn’t get mushy (toss with a little olive oil so it’ doesn’t stick too much). More Delicious Italian Soup Recipes to Try! 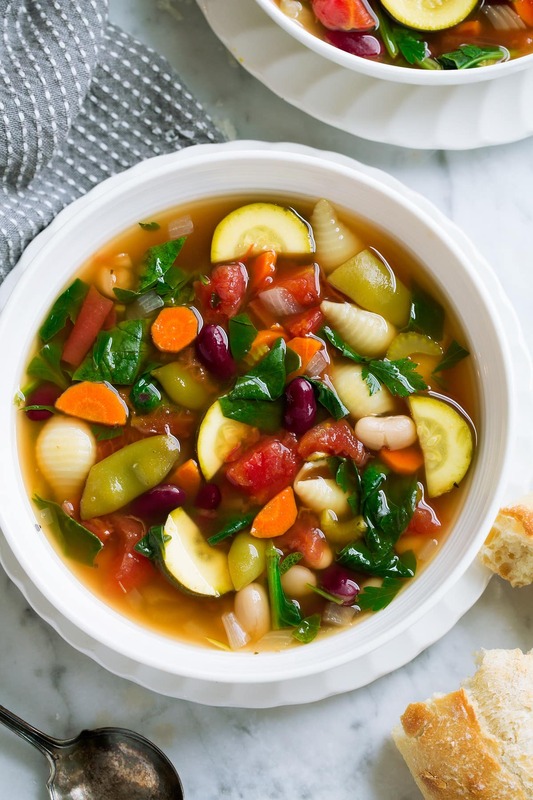 This healthy, flavorful minestrone soup is packed full of hearty vegetables, beans and pasta and it couldn't be easier to make! 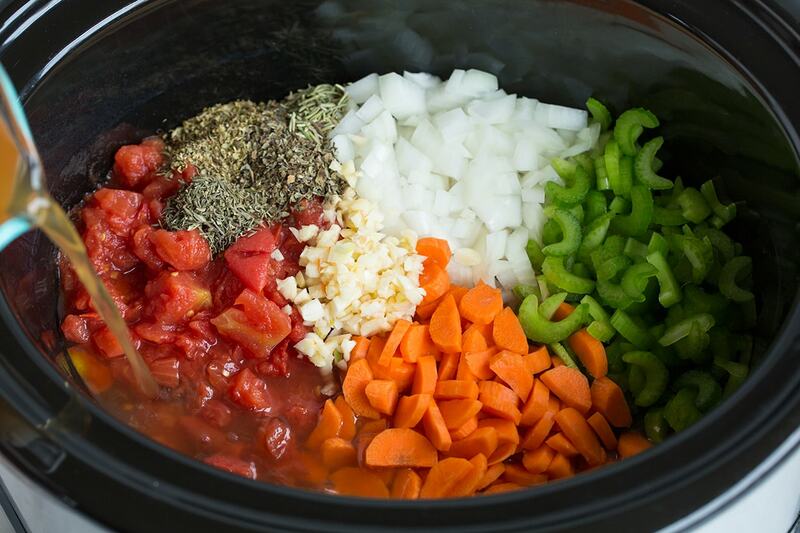 Slow Cooker Method: Add vegetable stock, tomatoes, celery, carrots, onion, garlic, basil, oregano, thyme, rosemary to a 6 or 7-quart slow cooker. Season with salt and pepper to taste and cook on low heat 7 - 8 hours or high 3 1/2 - 4 hours. Stir in zucchini, pasta, green beans, and cook on high heat and additional 20 - 30 minutes or until pasta is tender. Stir in more vegetable broth to thin as desired. Serve warm topped with Romano cheese. *If you don't have all of the dried herbs listed 1 1/2 Tbsp Italian seasoning can be used instead. Add carrots, celery and onions and saute 4 minutes adding in garlic during last minute of sauteing. Pour in broth, water and canned tomatoes. Add herbs and season with salt and pepper to taste. Bring to a boil, cover and reduce heat slightly, allow to gently boil 10 minutes, then add zucchini, green beans and pasta, cover and gently boil 10 - 15 minutes longer, or until pasta is tender. Recipe originally listed 1/2 tsp sugar and 2 bay leaves added as well but I felt these aren’t necessary and omitted to cut down ingredients list. Also listed was broth and water, it makes more sense to use more flavorful broth so omitted water and used only broth. I found frozen Italian green beans so prefer those over canned (less salt, better flavor). Regular green beans will work great or even asparagus. If adding fresh green beans or asparagus chop and add with zucchini.